It is a clean a break with Thatcherite neoliberal dogma that you could wish for. 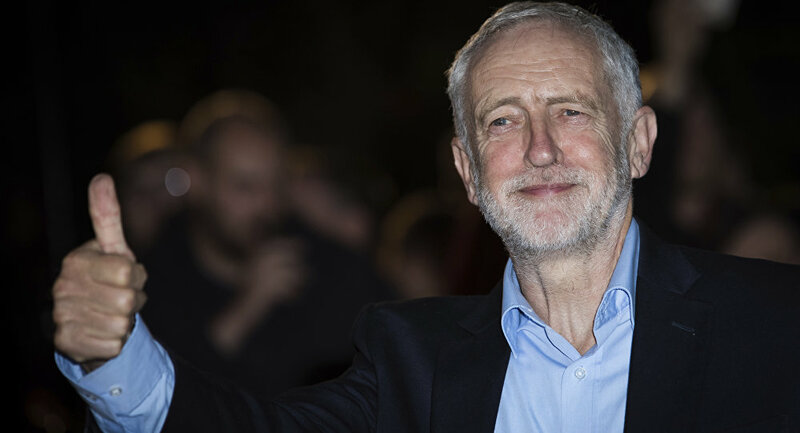 Speaking in Birmingham on Tuesday, opposition leader Jeremy Corbyn lambasted the government's industrial policy and promised that the next Labour government would ‘reprogramme’ the UK economy so that manufacturing- and not the financial services sector came first. ‘For the last 40 years… we've been told that it's good — advanced even — for our country to manufacture less and less and rely instead on cheap labor abroad to produce imports, while we focus on the City of London and the finance sector," Corbyn declared. He pledged that under his new 'Build It In Britain' scheme, the ‘huge weight' of the government's ‘purchasing power' would support British workers and British industries. He noted that the current Conservative government had offshored the production of new British passports to France- taking work away from Gateshead in the north-east of England. They also are sending a £1bn contract for three new ships for the Royal Fleet Auxiliary overseas, instead of having them made in UK shipyards. Corbyn's speech was attacked not just by right-wingers but also by some liberals and leftists who mistakenly described his approach as ‘nationalistic', or even ‘Trumpesque'. ‘Jeremy Corbyn is doing a great job as leader… of UKIP' was the title of one critical piece in The Independent. In fact, Corbyn's policies are sheer common sense and a welcome return to the best socialist/social-democratic traditions of his own party- before liberal globalists, unconcerned over the destruction of well-paid manufacturing working-class jobs in places like Sunderland, Glasgow, and the West Midlands, and more concerned in fighting cultural wars- and not economic ones-took over. His ‘Build It In Britain' strategy reminds one not of ‘the far right', but of the pro-export, pro-manufacturing policies of Labour's most successful leader, the four-time election winner Harold Wilson. Aided by the devaluation of 1967, Wilson's Labour government energetically pursued an export drive in the late 1960s. Resources were diverted into manufacturing. A Selective Employment Tax (SET) was introduced to make the cost of employing someone in manufacturing relatively cheaper compared to employing them in non-exporting service industries. Additionally the government also endorsed an ‘I'm Backing Britain' campaign, initiated by five secretaries in Surbiton- in which people were encouraged to work an extra half an hour a day to boost productivity. Again, there were critics, but the policies worked. Given their impressive record in office UK Labour did not deserve to lose the June 1970 General Election, but less than three years later Wilson and his team were back, once again, with a programme which put industry first. The Labour governments of 1974-79 did an excellent job in weathering a global economic storm caused by the oil-price shock of 1973 and in 1978, with North Sea oil revenues coming in, the long-term economic prospects for Britain looked extremely rosy. However, in 1979, Mrs Thatcher put Britain on a very different path. State support for industry was withdrawn. A massive programme of privatisation — urged by the investment banks who handled the sell-offs- was initiated. Unemployment rocketed. The economy was radically restructured to suit the City of London and the financial services sector. These reforms were not reversed when Labour returned to power, in 1997, under Tony Blair. Instead 'New Labour' fully embraced banker-friendly neoliberal globalisation. The net result of nearly forty years of Thatcherism is that the UK economy is heavily dependent on imports and we have foreign (and often foreign state) ownership of our railways, energy companies and much of our infrastructure. Nearly every manufactured article you buy in Britain is made overseas- but when you go abroad you struggle to find British-made goods. As Larry Elliott notes in his excellent Guardian column ‘The country that brought the world the industrial revolution has not run a surplus in trade in goods since 1981. We simply can't carry on like this- importing far more than we export. The neoliberal economic model- the one which says manufacturing doesn't matter is broken- and we need a new approach. Jeremy Corbyn's proposals- which include Britain staying in a customs union with the EU post-Brexit, provide a sensible blueprint for the future. His Establishment critics- wedded to globalist nostrums- can offer nothing but sneers and the continuation of the status quo. The views and opinions expressed in this article by the contributor do not necessarily reflect those of Sputnik. British Tories Imploding — Jeremy Corbyn as UK's Next Prime Minister?